"Salting the ribeye steak two days prior to cooking brines the steak, helps tenderize it, and adds rich flavor." Two days before cooking, salt both sides of each steak with 1/2 teaspoon Diamond Crystal(R) Kosher Salt per steak. Place steaks in an airtight container and refrigerate until ready to cook. Remove the steaks from the refrigerator about 30 minutes prior to cooking. Sprinkle both sides of steak with black pepper. Heat cast iron pan over medium-high heat until very hot. Add vegetable oil and heat until oil shimmers. Carefully place steaks in pan. Cook until brown and hard-seared on one side, 4 to 5 minutes. 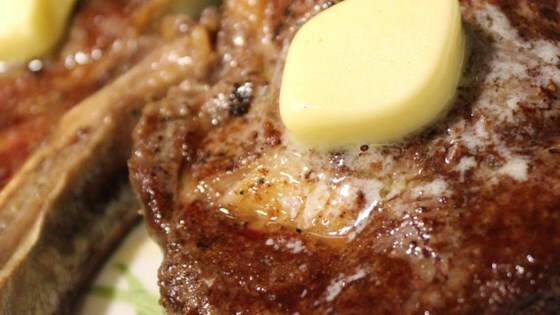 Turn steaks and top with one teaspoon butter. Cook for 3 to 4 more minutes or to desired doneness. You may need to cook the steaks in batches depending on the size of your cast iron pan. Keep the cooked steaks in a 170 degree F oven until ready to serve. Brought steak to room temperature, delicious. I like mine medium well, and brining for two days helped tenderize it. Liked that it was simple and not "overthought". Made with fries. Yum!